Well, that dependence on Mithrandir was exactly why Professor Tolkien had him fall in Moria and constantly otherwise vanish on some errand or another. In The Hobbit, Gandalf disappears before a certain scene with three hungry trolls, swiftly returning, and then again left Bilbo and Dwarves as they entered Mirkwood to appear again just before the Battle of Five Armies. Then, in The Lord of the Rings, he fails to meet Frodo as he sets out and is thus gone for the better portion of book one (until Rivendell), falls in Moria and does not reappear until Fangorn in book two, and leaves again until after the battle of Battle of Helm's Deep. Being Gandalf, he is always doing something of critical import that is usually revealed later, but the point is that the characters are constantly forced to go on without him. 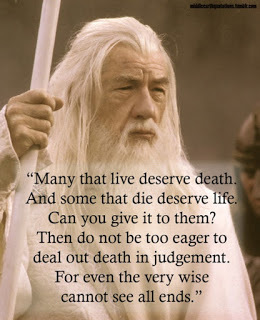 Indeed, Frodo and Sam believe him to be dead from Moria to after the Ring is destroyed. The lesson? That Tolkien found an ingenious way to counteract any over-dependence on Gandalf without having to kill him. George R. R. Martin, on the other hand, seems to rely on killing to remove such characters; goodness knows any and all Gandalf-figures in A Song of Ice and Fire are cold and buried or cold in anOther sort of way (with the possible exception of Doran Martell, who was introduced fairly recently). Indeed, I have little doubt that GRRM would have found it more fitting if the wizard had come back as Gandalf the Wight.